Why do you think ‘21’ Club has endured and thrived for over 80 years? It’s a balancing act. What we’ve found is the core here is to stay true to who we were – to stay authentic, to keep the history, to keep the art, to keep those core values of the finest foods and the finest wines which we somehow managed to instill during a time of Prohibition where neither fine food or fine wine were a priority – and to balance that with a contemporary clientele and a contemporary palate. What are some Prohibition-era adaptations that have remained to this day? We still have our secret wine cellar. Guests have the opportunity if they ask for it, and as long as there’s not a private event down there, to get a history tour – to see the two-and-a-half-ton door that still hides our incredible wine cellar. ‘21’ is one of only eight restaurants in NYC to have the Grand Award from Wine Spectator. We have more than 1,500 selections, more than 20,000 bottles, so it really is the go-to for somebody who is keen on wine. There is a strong connection to our history on the wine side and on the culinary side. Can you describe further your approach to the cuisine? ‘21’ has seven classic dishes that will never change or only slightly be tweaked, and those are true American classics: Caesar Salad, Steak Tartar, a crab cake – what we may think of as everyday dishes but they’ve been served here since the 1930s, and we blend those with contemporary takes on familiar dishes. So maybe guests are familiar with Carpaccio; well chef Delpique does it with octopus and pomegranate and it’s light, and lovely and beautiful. He just launched a Lamb Carpaccio, which isn’t something you find everywhere that definitely appeals to a contemporary palate, but it’s also based on classic dish technique. So ‘21’ has really been able to bridge that gap between past and present and that’s why we’re still here. What is “Bar ‘21’ & Lounge” and how is it different from your “Bar [Dining] Room”? I equate Bar ‘21’ with a Chanel lipstick. It’s that little piece of luxury that’s tangible to anybody. You can come in and have a cocktail and some sliders at the bar, or a great sandwich during lunch, and not maybe be ready for the Dover Sole in the dining room, which is jackets required (no jeans or sneakers). The Bar Room is a more formal dining experience, but there’s still a lot of fun and personality. A bit of sophisticated fun, if you will. What are some special aspects of your establishment that most visitors may not be aware of? One thing special that we have that maybe falls a little under the radar and is sort of “in the know” is a lovely, intimate room that only seats about 25 guests known as the “Upstairs at ‘21’.” It’s only open to guests on Friday and Saturday evening and serves as the chef’s opportunity to highlight some of his favorite dishes in a four-course tasting that is at a price fixe of $95, which is really approachable. The whole room is really soft and beautiful, very intimate, and has these gorgeous murals of NYC in 1935. This room is very romantic and a bit under the radar, perfect for special occasions like Valentine’s Day or a special anniversary. Guests will surely want to “look upward” while dining at ‘21’ Club. Tell us why there are few more unique or tantalizing ceiling-scapes anywhere in the world. Today we have over 1,000 “toys,” as we fondly call them, hanging from the Bar Room ceiling and every single one is a gift from a guest. They include some of the country’s biggest companies but also gifts from Presidents, athletes and entertainers. We have a model of the PT-109 [the boat JFK was once stationed on and commanded] behind the bar that JFK gave us after he dined with us on the eve of his inauguration. President Clinton, while he was in office, held a birthday party for Chelsea here and gave us a model of Air Force One. One of our most recent additions is Jimmy Fallon’s microphone from The Tonight Show. Yet even with ‘21’ Club’s fabulous storied history and elite clientele, it’s still a wonderful destination for NYC visitors, correct? Absolutely, it’s a restaurant that anybody can come to. ‘21’ has never been a private club. Just steps from Radio City, Rockefeller Center and several Broadway theatres, it’s the perfect starting point for a night on the town. 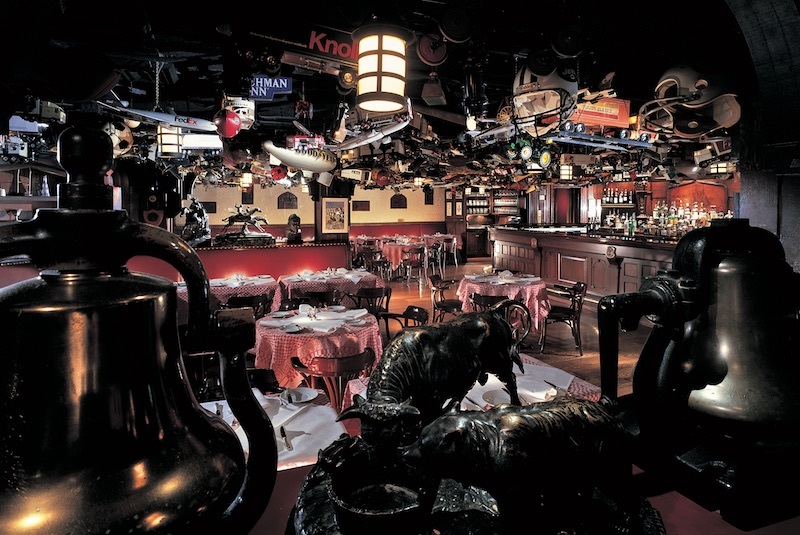 Combine that with exceptional service, sumptuous cuisine, incredible history and the possibility of a celebrity sighting and you have the ultimate NYC dining experience.